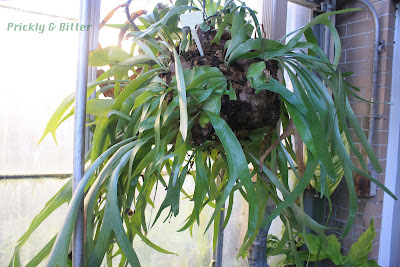 This species of staghorn fern is native to Australia and the surrounding areas, in tropical rain forests (you can read all about another species of staghorn fern HERE). Staghorn ferns are not parasites despite commonly growing off of other trees; they merely use these trees for support, and gather most of the nutrients they need to survive from the air. They will also commonly grow on dead standing trunks, and are important in helping break down organic material to return it to the soil, a vital process in any ecosystem (but a process that must be exceptionally fast in tropical systems because they are so productive) called nutrient cycling. 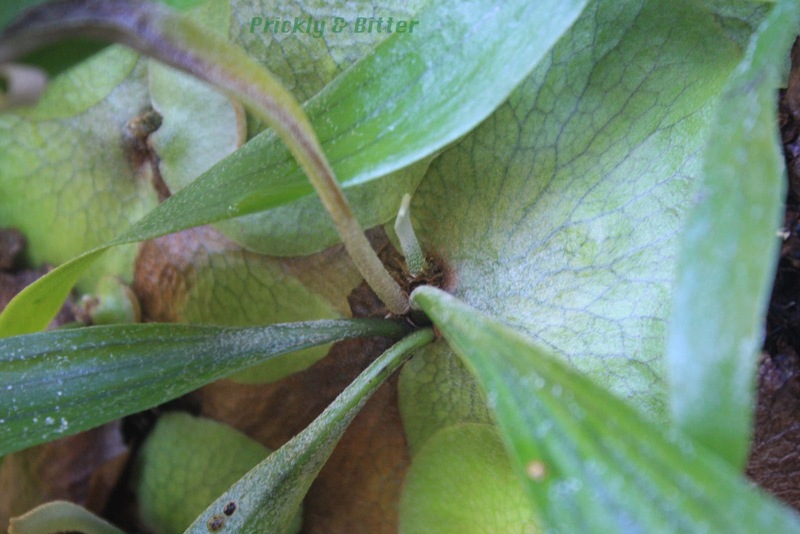 All ferns can reproduce in two ways, but most of the time you only notice one of these ways. Ferns are vascular plants, but they are in a group that branched off before the "invention" (the evolution) of seeds. So, like mosses and lycophytes, they reproduce via spore production. This spore production occurs on fertile fronds of ferns (what we call "leaves") in sori (sing. sorus), or the brown powdery masses on the underside of the leaves. Sometimes they're in distinct clusters, and in other species they completely cover the outside bottom surface of the frond. Where the sori and located and what they look like can be an important factor in distinguishing species! When spores germinate, they don't produce more fronds. They produce tiny little plants called "gametophytes" (the frond is the "sporophyte", a plant [-phyte] which produces spores [sporo-]) which produce gametes just like regular plants do. The gametophytes produce eggs and sperm (in higher plants, "plant sperm" is pollen), which fuse together to form the zygote which matures into the sporophyte. 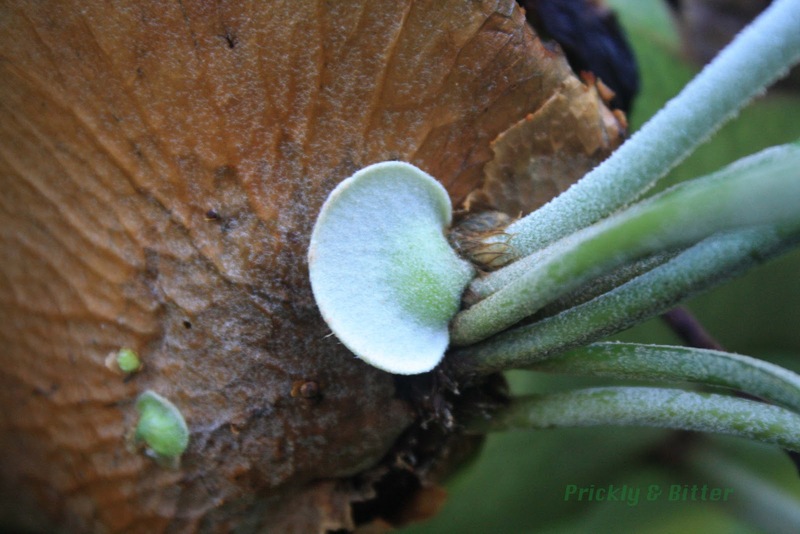 Normally, none of us are observant enough to notice the gametophyte, because it is so incredibly small (rarely more than a few millimetres across) but in the staghorn fern they can be up to 3 cm across. I didn't notice any while I was taking photographs, but I also wasn't looking very hard. 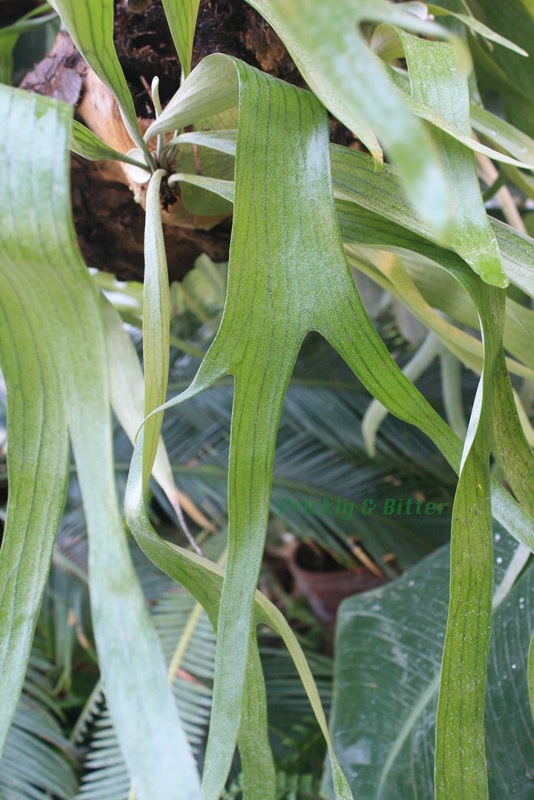 The staghorn fern, like many species of fern, produces two different types of fronds. The first type, the sterile fronds, are large and shield-shaped. Their role is to protect the roots of the fern from drying out, and in some species act as reservoirs to catch rainwater. The other type of frond is the fertile frond, which are the long, antler-shaped leaves coming out of the opening in the basal fronds. When one basal frond starts to rot (something which I imagine must happen quite frequently; if they're designed to catch water and protect something that must always be wet, they probably rot away quite quickly! ), it is replaced by a new basal frond growing off the roots which you can see in the bottom photo. The production of this new basal frond is incredibly rapid; it can go from being a few millimetres across to a few centimetres across in a week or less.